‘This year has absolutely flown by.’ That’s something you’re likely to hear a lot of at this time of year and, for most of us, that’s not particularly positive. Spare a thought for Brendan Rodgers, then. Back in April, the world probably seemed a much rosier place than it does now for the Reds’ manager. Going into the last game of the month, his side were sitting pretty at the top of the Premier League table, three points clear of Manchester City in second and five ahead of Chelsea back in third. Three games were all that separated Liverpool from their first league title for 24 years. Then came the now infamous encounter with Chelsea at Anfield and that Steven Gerrard slip. It was a mistake Jose Mourinho later stated handed City the title. Following the drama of that Sunday afternoon, Liverpool crumbled in their next encounter – throwing away a vital lead at Crystal Palace to draw 3-3 with the Eagles in yet another emotional rollercoaster of a match. That, in reality, was the final nail in the coffin for Rodgers and his side’s title ambitions. Today, the former Chelsea reserve team manager finds his fortunes to have flipped almost 180°. Liverpool are languishing in mid-table – behind Everton – and have recently been dumped out of the Champions League. This has left many questioning whether Rodgers will still be in the Anfield hot seat come the end of the season – with bookies such as betfair placing him as third favourite to be the next Premier League manager to leave his position. How unthinkable that would have been this time last year. However, I for one still think he’s the right man for the job and, although I rarely agree with him, it seems Robbie Savage shares my view. Yes, it’s true that Liverpool are falling well behind their pre-season expectation levels. But if you were to rewind the clock only as far as three or four years, the mere fact that they were in a position to be knocked out of the Champions League would’ve been a minor miracle. Kopites must have been dreaming of a chance to play at Europe’s top level again during the tenures of Roy Hodgson and Kenny Dalglish. That time has come again, the prestige of Champions League football was bestowed on Liverpool once more and the man who steered that particular ship to shore was Rodgers. His crew might be facing choppier waters this time around but how often is that the case when a club has to learn – or relearn – how to balance the demands of domestic and European football? Frequently, that’s how often. Just look at Manchester City. With all the money they have, they’re arguably still finding their feet in top-level competition. Yes, they’ve had decidedly difficult groups to negotiate since first arriving on the scene and just as tricky knockout-round draws. But it’s been far from plain sailing nonetheless. Liverpool, on the other hand, didn’t have the sort of financial muscle to handpick the world’s greatest talent ahead of an assault on the competition and were without the talismanic Luis Suarez – the man predominantly responsible for getting them there in the first place. If that wasn’t a strong enough argument for Rodgers to rest his hat on, his team were also dealt the massive blow of losing their second top scorer from last season, Daniel Sturridge, ahead of the Champions League campaign. And, just to rub salt into the wounds, it was an injury the striker picked up while away on England duty. Take Diego Costa and Cesc Fabregas out of Chelsea; take Sergio Aguero and David Silva out of the City squad. It’s hard to argue that without these key players those teams would be anywhere near as strong as they currently are. Just look at how Chelsea performed last season without that duo. Well, that sort of situation is exactly what Rodgers has to deal with at Liverpool right now and he’ll be able to turn it around if he’s given time, support and a bit of help in the transfer market. It’s true that the Reds are missing more than firepower this year. Goalkeeper Simon Mignolet, so crucial to saving points for Liverpool during the 2013/14 season, has also been far from his best and has been dropped. And signings such as Adam Lallana, Dejan Lovren and Mario Balotelli have struggled to settle into the side. However, yet again, it’s time that the side need in order to gel. Those of us on the outside of football sometimes forget that it’s a far more complex game at elite level, with tactics playing such an important role – and no player can be expected to immediately slot into a new approach. Finally, those calling for Rodgers to be sacked would do well to consider the situation at Chelsea, and perhaps pull back in their criticism a little. Back in 2007, the news broke that Mourinho had left Stamford Bridge, supposedly by mutual consent, after winning back-to-back league titles, two League Cups and an FA Cup (for good measure). Why? Well, though it can’t be confirmed, a lack of Champions League triumph has been singled out as the primary factor (Mourinho left the club following a home draw against Norwegian outfit Rosenborg). Season after season went by with manager after manager – appointed, then dismissed, by Roman Abramovich – promising, then failing to deliver the European title. Of course, they did succeed in reaching that particular summit in 2012 following an unforgettable night in Munich but the manager in place at the time, Roberto Di Matteo, was soon shown the door the very next season. And where do the club now find themselves? Back with Mourinho in charge and looking set to enjoy their finest ever season. There’s a lesson on consistency and stability in there somewhere (and we’ve not even discussed the story of Alex Ferguson). 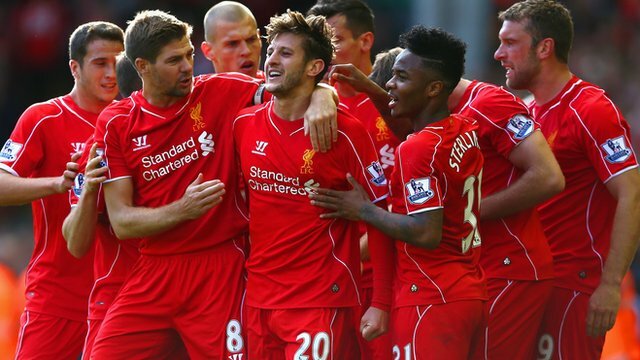 There’s no doubt that Liverpool are looking at a real slog through Christmas and beyond. But, despite how contrasting their current season might be when compared to last, Liverpool fans need to believe that Rodgers can wake them up from this nightmare. He was the man who made them dream, after all. Manchester United captain Wayne Rooney says that he felt that his team deserved at least a point from the recent Manchester derby. City managed to claim a fourth consecutive win in the derby after Sergio Aguero’s second-half goal was enough to give them a 1-0 win. Rooney was making his comeback from suspension against City. He is one of the few players in this United squad who has excelled previously in Manchester derbies. Even though he had not played in the last few weeks, Rooney showed no signs of rustiness and was one of the better players over the 90 minutes. Despite being reduced to 10 men after Chris Smalling was sent off in the first half, United showed a lot of confidence to create several chances. Rooney, in particular, went on a wonderful solo run that deserved a goal. As it is, United still remain without a victory away from home this season. They also lost the first match since the 5-3 defeat against Leicester City. Rooney was disappointed with the outcome of the encounter. However, he says that United can take heart from the performance that they showed despite going down to 10 men with more than an hour remaining. The result sees United at 10th place in the table with just 13 points. “We responded well and defended well [after conceding]. I felt for long periods of the game we were the better team. We took control of the game with 10 men and created the better chances. We were unfortunate not to get anything out of the match and we’re disappointed to leave with no points after a great effort. Chris is disappointed. It’s tough when you get sent off, especially in a derby and with such a long time to go in the game it made it difficult for the rest of us to hold on. I’m sure Chris will learn from that,” said Rooney.